MultiBrief: How do business groups view the Green New Deal? How do business groups view the Green New Deal? 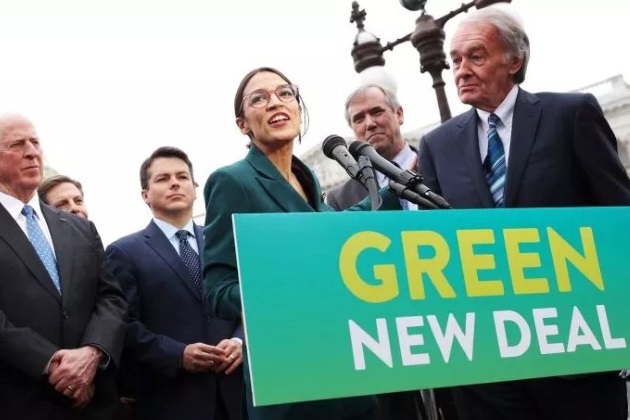 The Green New Deal (GND), a resolution in both houses of Congress, arrived on Feb. 7, thanks to Rep. Alexandria Ocasio-Cortez (D-N.Y.) and Sen. Ed Markey (D-Mass.). The GND "would create millions of good, high-wage jobs in the United States, provide unprecedented levels of prosperity and economic security for Americans, and counteract systemic injustices — all while addressing the existential challenge of climate change," Sen. Markey said in a prepared statement. What about the sustainability costs/benefits in business? We turn to Tim Huelskamp, Ph.D., president of The Heartland Institute, who represented Kansas’ 1st District in the House of Representatives from 2011 to 2017. "Extreme," he said in an email statement to MultiBriefs. "That’s the only way to describe the socialist Green New Deal. With its failure in Venezuela, Ocasio-Cortez, Markey and their fellow Democrats have picked a bad time to force socialism here in our country. Rest assured, The Heartland Institute will continue to lead the opposition to this socialist green dream." The GND proposes a 10-year mobilization to decarbonize the U.S. economy. There is a scientific consensus that carbon emissions are cooking the earth’s biosphere, and there is a short time for such action to avert a catastrophe, according to the Fourth National Climate Assessment. The U.S. Chamber of Commerce hews to the market-based solutions of The Heartland Institute, equating the GND with socialism. Neil Bradley is the executive vice president and chief policy officer of the USCOC. "In one approach, as exemplified by the ‘Green New Deal,’ government asserts control over most of our economy, passing along the enormous costs and bureaucratic inefficiencies to everyday Americans," according to Bradley. "In the other, our robust system of free enterprise rises to the challenge, tapping into our deep well of ingenuity and creativity. This is the approach that built our nation and made us a land of opportunity for all in stark contrast to failed socialist policies that have plagued many other countries over time." Other business groups see the GND differently, namely as a business opportunity. David Levine is the co-founder and president of The American Sustainable Business Council based in Washington, D.C.
"There is a tremendous opportunity to reduce the impacts of climate change/extreme weather and reap the benefits of innovative drive towards safer cleaner technologies and products," he said in an email interview with MultiBriefs. "A Department of Energy 2017 U.S. Energy and Employment Report shows that clean electricity jobs are no doubt the engine that drives America’s electric energy economy, outstripping the number of paychecks provided by the fossil fuel industry by at least five to one." "Nearly 1 million Americans are working near- or full-time in the energy efficiency, solar, wind, and alternative vehicles sectors. This is almost five times the current employment in the fossil fuel electric industry, which includes coal, gas, and oil workers." make the United States the international leader on climate action and help other countries achieve a Green New Deal. "I welcome the Green New Deal," House Speaker Nancy Pelosi (D-Calif.) said during her weekly press conference on Feb. 7. She did not mention bringing the resolution to a vote. Advisor vs. coach: Is there really a difference? Should you leave stability and join a healthcare startup?